يقع Hilton Lake Taupo Hotel في Hilltop, تابو, هو خيار شائع بين المسافرين. يمكن من هنا للضيوف الاستمتاع بسهولة الوصول إلى كل ما تقدمه هذه المدينة النابضة بالحياة. بالنسبة لمن يريد الخروج، هذه بعض المعالم السياحية المتوفرة للزوار ‪Wairakei Geothermal Power Station‬, ‪Formula Challenge Racing‬, توبو بونجري. يقدم Hilton Lake Taupo Hotel خدمات لا غبار عليها وكل أشكال اللياقة وحسن الضيافة اللازمة لإسعاد ضيوفه. يمكن للنزلاء الاستمتاع بالميزات التالية: خدمة الغرف على مدار الساعة, مرافق مخصصة لذوي الاحتياجات الخاصة, واي فاي في المناطق العامة, خدمة صف السيارات, صف السيارات أثناء إقامتهم في هذا المكان الرائع. ادخل إلى واحدة من الغرف 113 وتخلص من عناء نهار طويل بمساعدة مجموعة كبيرة من الخدمات كمثل تلفزيون بشاشة مسطحة, حوض الاسترخاء, غرف لغير المدخنين, مكيف هواء, تدفئة الموجودة في بعض الغرف. يمكنك الاستمتاع بالأجواء المريحة التي تقدمها مركز للياقة البدنية, ساونا, مسار جولف - ضمن 3 كم, حمام سباحة خارجي, تدليك طوال النهار. مهما كانت أسبابك لزيارة تابو، فإن Hilton Lake Taupo Hotel هو الخيار الأفضل لإقامة مثيرة وممتعة. Loved our stay here! We decided to come here to celebrate our one year wedding anniversary and it was great! Loved our stay and loved the staff! The pool was amazing, can’t wait to stay here again! It is more of family hotel with a fantastic lake view .. The apartment I booked spacious with simplicity . special thanx for Lucy from the reception .. She help us a lot to plan our tours in taupo. They need more staff .. It was faster for me to walk to the reception than wait for someone to answer my call .. It was not that long walk but maybe it will not be the case with other people. Short drive from the city centre. Free open-air onsite parking available. Can opt to pay for covered, secured parking. Rooms are spacious and clean. Baby cot was available on request. Friendly staff made the stay all the more enjoyable. Stayed here for one night with little person in tow. Room was ready early and was clean and well appointed. Nice little patio to sit in outside. Ordered room service for dinner which was decent and arrived quickly, but nothing too memorable. Pool and hot tub were lovely. Nice rooms and comfortable bed but the pillows were too flat and lacked oomph for my liking (and given a 5 star hotel). Good facilities, location is still a few min drive from town center hence it’s rating but still close enough to the town center (but need your car). Parking is plentiful. 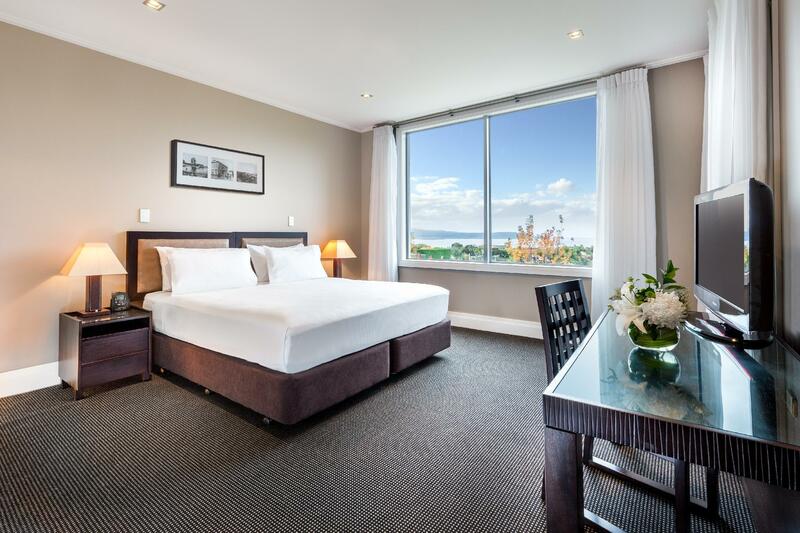 We chose a room with a view of Lake Taupo and it was our best decision. Don't expect much about the service even though it's under the Hilton brand. Hardly any service from the front desk and there is no concierge. Housekeeping was the only service you can expect. Kudos to the housekeeping team for being prompt. I recommend this hotel for the awesome view. Having thought about the stay at the Hilton Taupo, and considering it is supposed to be a 5-star hotel, really it was as expected. The room size was good and the staff were attentive - room service was efficient and the secure parking was a bonus. Actually, the staff were one of the best features of the hotel. But $10 for wi-fi for a day was unnecessary, from the room to the restaurant outside (and some rain) is bad design (I did not trust my car in the car park given the location), and while it is expected to be expensive, it did not represent value for money given other hotels I have stayed in recently. Staff were all polite and helpful. Room was great and bathroom was huge and clean. Loved the pool area - great to wind down in the afternoon. Loved it. i book a lake view one but I didnt see the lake, instead it was bushes and what looks like a downhill without any fences. abit scary for the kids. it was a bit tricky to go to our rooms because of many unnecessary heavy hallway doors. i had to go through like 3 or 4 doors from my room to my mom. anyway my mother would get lost in it i guess LOL! and you should pay extra if you want to park the car inside (near our room). a bit disappointed, because the hotel room was not cheap either. and the way from the reception to the room was quite a trip too. I love staying at Hilton and this was no exception though I punted for the lake view room and in hindsight don’t think it was worth the extra money. The rooms that face the rear (away from the lake) actually have a very nice & peaceful view. And the hotel being on a Hill certainly gets the wind when it’s up which is common when you’re overlooking a giant lake. So go for the garden view and save the money for the fantastic bar and restaurant. Both of which I enjoyed. Staff are also great! On check in I was given some great tips for places to visit. Where do I start..?! I have thought long and hard about submitting a review as bad reviews can be pretty damaging to any business. I have made a complaint directly to the Hilton Hotel and no response in 3 months..so here goes. Check in-Room key given, no clear instructions given to us, nobody from guests services offered to help us, found a car park and eventually found the elevator and a trolley. Small, tight labyrinth like hallways but after a bit we did find our room. Opened the door as was greeted by..someones luggage?! The room had either been a double booking or some had not checked out, security for those people and their belongings..not flash! A bit frustrated now..Che Off to reception and walked past a balcony room with a pungent and unique smell coming the room, reception dealt with our concern, they upgraded us but the next day we were given another restaurant bill when we checked out..Not Great at all. Couldn’t fault the staff, location or the food at the Bistro. Thoroughly enjoyed our stay. 3 bedroom apartment was amazing. Loved the views and the kids enjoyed the pool. Can't wait to go back. Rooms are very boring and plain. Could do with artwork and some colour. Cosy throw rug be nice. No fresh milk or tea towel as seen in other local hotels for half the price. Comfy bed. Clean. Nice staff. The staff Natalie is really nice and helpful to us. We had a wonderful stay there. Glad to have stayed here on our New Year's Eve celebration. The place was quiet and facilities were great. It's a big plus having it nestled on top of the hill overlooking the lake, so we saw the fireworks without really being close to it. Disappointed that hotel is not at least walking distance to lake. If you are going to Lake Taupo you should stay close enough to be able to walk around it or where the restaurants and shops are. The hotel itself is very nice and did have a nice pool, sauna, fitness area however we would have preferred to be on the lake to enjoy the walks in the morning and at sunset without having to drive down and find parking. If your not concerned with that then this a great hotel. The do need to provide better pillows though as they were flat and foldout sofa bed was very uncomfortable for the price of the stay. Also try to get a front view of the lake then you can at least see the lake in the distance. 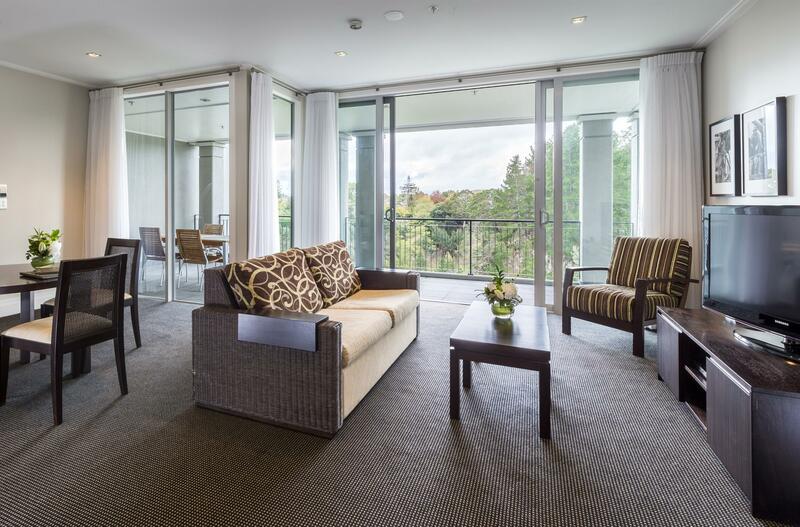 Although Hilton Lake Taupo is not located at the centre of town, about 5 mins drive. But the scenery and nature feature of landscape at Hilton is amazing. The room was spacious, clean and bed is comfortable. The staffs are very friendly. We love the breakfast here. Highly recommended. What we liked: - Next to the DeBretts spa - Room was nice What we didn't like: - We came in at 5pm and the room wasn't ready until almost 6, the room allocation was not great, we could've gotten connecting rooms, but for some reason didn't. Staff didn't apologise but offered if we wanted it right then she can give rooms that are 3 buildings apart instead. - Breakfast was nothing spectacular, basic stuff.